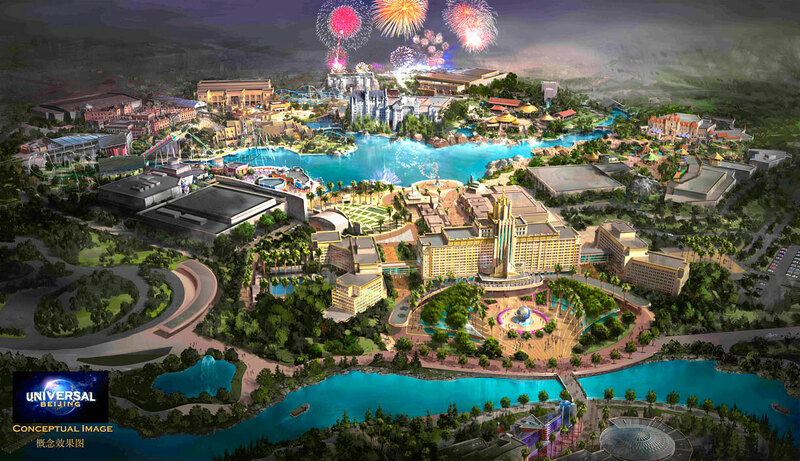 October 13, 2014, 9:03 PM · Universal Parks & Resorts confirmed its Universal Studios Beijing project today, with a formal announcement with Chinese officials. We'd known about the Chinese project for some time, as official reports from China had detailed its progress through the local bureaucracy. 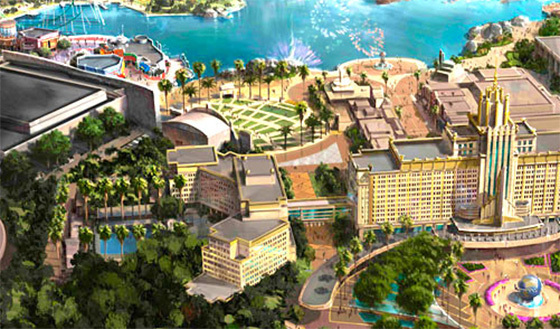 Predicted to open in 2019, this US$3.3 billion, 296-acre park will be Universal's largest (if you don't count the Hollywood backlot), and the company's sixth theme park (seventh if you count the Moscow indoor park which was supposed to open in 2018, but hasn't seen any construction progress in months). Universal's other parks include one in Hollywood, two in Orlando, one in Osaka, Japan, and one in Singapore. Previously announced parks in South Korea and Dubai have been cancelled. But let's take a look at the concept art to see what clues we might find about this new theme park. Concept art courtesy Universal. Click for higher resolution. We've got a CityWalk at the bottom of the image, with a bridge leading to a plaza surrounding the familiar Universal globe. A massive hotel stands at the far end of this plaza, straddling the entrance to the park. Let's zoom in and see what's inside the park. We start with a Hollywood Boulevard entrance plaza, with an amphitheater straight from Universal Studios Florida to the left. Beyond that, it's not clear. Could that be Springfield? Or maybe Sesame Street? (Don't forget that Universal holds the Sesame Street theme park rights in Asia.) Let's continue around the lagoon, for things get much clearer in the next image. That's obviously Orlando's Incredible Hulk coaster in the middle. To my knowledge, Universal would not have the rights to the Marvel franchise in China, but nothing is keeping Universal from duplicating the coaster with another theme. But it is what stands behind Hulk that really captures the imagination. That's clearly Diagon Alley to the left. You can see the London facade in the front, with the tracks of the Hogwarts Express extending from the station at the right of the London facade. Behind those tracks stand what looks like a Revenge of the Mummy building. In front of that, at the end of the tracks, is Hogsmeade village, though it looks a bit different without the snow on the roofs. That's the Flying Hippogriff coaster on the peninsula, with the bridge above that leading to Hogwarts Castle. Above the castle? Maybe a Dragon Challenge coaster? But that building behind it looks large for its queue. Moving clockwise around the lagoon, we come to Jurassic Park. You can see the Discovery Center on the left side of this image, with the main show building and final drop of the River Adventure ride above that. Continuing to the right, over the bridge, leads us to the Shrek-themed Far, Far Away land from Universal Studios Singapore — that's the big castle facade there. In front of that appears to be the Madagascar land from Singapore. The green-topped carousel in the middle appears to be King Julien's Beach Party-Go-Round and the shape of the show building to the right is consistent with the Madagascar: A Crate Adventure ride there. That leaves the large, flat-topped building in between Madagascar and returning to Hollywood Boulevard. Guesses? One would think that there would be a Transformers ride in here somewhere, but I didn't see an obvious sign of it. 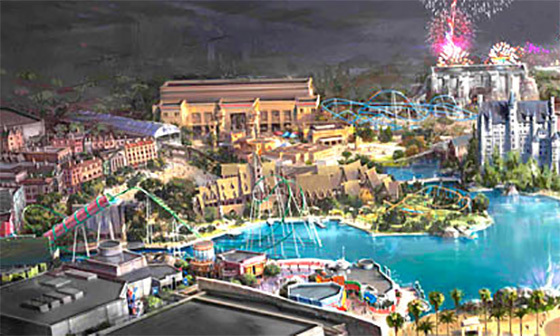 Of course, all this might not be any more than a mash-up of existing Universal theme park IP, and have nothing to do with final plans for the park. Disney's been exceptionally reticent to share concept art for its new Chinese park in Shanghai, in part due to concerns that competitors would use it to build copycat parks before Disney could open. Given the lax state of intellectual property protection in China, it would not be surprising to see Universal try a misdirection here, showing people concept art from all its existing attractions, then developing something different for the actual Universal Studios Beijing. October 13, 2014 at 9:25 PM · There's a transformers ride right next to hulk! October 13, 2014 at 10:40 PM · Ahh... Tucked in between Hulk and the Sesame Street thing. Yeah, I see that now. Thanks. October 14, 2014 at 3:14 AM · The large building behind Hogsmeade reminds me of the entrance for The Mummy at USF. Columns and a couple of statues in the middle. October 14, 2014 at 3:42 AM · It could be that you are right with your "misdirection" concept: especially looking at the HP and Mummy area - the mummy looks especially out of place in the middle there between "London" and "Hogsmeade" - also to put Hogwarts express as a monorail in the middle of the park like that seems odd and to put the huge Hogwarts castle also right in the middle with all four sides exposed seems a very expensive solution: a full harry potter area would make much more sense in a (for better description" "hong kong disneyland expansion" area that is aside of the main guest loop. And when the Mummy isn't in the middle of the area. Also to put Hippogroff and the Shrek coaster there (virtually the same experience) does not make sense at all - the Beanstalk/Puzz ride would at least have another experience (thankfully I don't see a JP flying coaster either). I am not sure if the simpsons are popular at all in China - the show building looks quite large for the USS Sesame Street Indoor Attraction. Also:we seem to be missing a Stunt Show theater for Waterworld, or whatever is the Chinese cup to Ceylon of choice and an important part of the entertainment mix (and looking at Disney's planned POTC show this is culturally transferable). October 14, 2014 at 7:05 AM · Universal is building incredible new themed areas, particularly with Harry Potter. One thing I find disappointing with them, particularly if this picture is accurate, is their copy and paste tactics between various parks. Once a ride is a success, they simply transplant it to all their other parks. No doubt this makes great commercial sense, but as an international traveller I fing it hard to justify going to one of their parks when I have already experienced the rides elsewhere. Disney obviously does this too, but not nearly to the same extent. You'd be hard pressed to argue that Tokyo Disney resort, Disney World, Hong Kong and DLR are carbon copies. This picture looks like a sensational park, and based on their previous developments I think it is most likely a somewhat accurate depiction. I just find it hard to want to go there when it seems to be more of the same. October 14, 2014 at 7:35 AM · What an incredible opportunity it must be to build an entire theme park from scratch in today's day and age. To have years of experience from other park projects and to know how to plan for everything learned from the past must be an amazing thing. Other existing parks have to deal with preserving the past for nostalgia, incorporating expansions seamlessly, cramped quarters from decades-old attractions that did not account for added traffic, and tons of other interesting but challenging obstacles as they move toward the future. But to design a new park from nothing, as is being done with Disney and Universal in China; that must be a cool thing. October 14, 2014 at 7:46 AM · It looks like a mashup of both Islands of Adventure and Universal Studios in Orlando. The lagoon is huge and it seems to take away space from potential attractions. A hotel at the entrance. It is larger than Hogwarts castle. I can't say I like the way they spaced out the attractions. There is no distinct areas/lands. Each attraction becomes the area. There is a missed opportunity to bring the Harry Potter lands to a new level. The Hogwarts castle on the edge of the lagoon makes it seem small. Diagon Alley should be on the East side of the lagoon. I often pictured the train going west. I'm wondering of Universal should retire the "Studios" portion of its name. It's not a Studio in any park outside of Hollywood. Since the park feature the best of both IOA and US, call it Universal's Adventures. 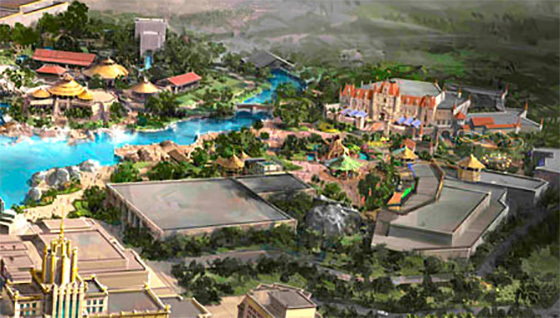 October 14, 2014 at 8:31 AM · Universal has pretty much gone to the concept of building a "land" around a singular attraction, so the inherit problem with the concept art for this project is that there are so many large attractions that it subsequently creates far too many lands. There doesn't appear to be much flow to this park, and unfortunately, aside from the blank building on the right next to "Far Far Away", there's not much room for growth. New theme parks do tend to have the problem of not having enough for guests to do in their first year or two of operation, but sometimes opening with too many attractions could lead to some of the same issues. This park does not appear to have much room to grow, and because of the unique nature of many of the attractions, it would be very expensive to rip out an original attraction to replace it with something new. However, we must all remember that this park is in China, and geared towards that market. I don't think planners are building this park expecting Americans to travel to visit frequently, and much like Tokyo Disneyland/TSD, the majority of guests will be locals. If it is in fact a proposed layout, I'm not convinced that the top-centre castle is Hogwarts. If we assume the bronze building is Mummy, that whole central area could well be themed to Classic Monsters - which we know Universal has big plans for. The castle is as much Neuschwanstein as it is Hogwarts, so could be drawn from any "dark Europe" mythology. Slightly different note, but: what is it with Universal parks and countries with worrying human rights records right now? I've also read they have an option to expand to 1000 acres. If that is true, I can't imagine they would want to start with both DA and Hogwarts in the same park. In any case this is a huge commitment from Universal. I'm glad to know Hogsmeade at USH and the new Kong attraction at IOA are already going full steam ahead. I would be disappointed if Universal only had Beijing announcements for the next 5 years. October 14, 2014 at 8:42 PM · As Jeff just mentioned, I was going to add that they do have 3x more land than what we're seeing, which is very smart. I can imagine them building a few resort hotels, but I hope they'll leave enough land for another park down the road. Seeing as how there is so much additional land that can be used in the future, having a big lagoon such as this would not be such a bad idea. My biggest question mark is about the location. Beijing's average January high is 32 degrees (low of 15). Are they going to shut the park down during the Winter? Paris and Tokyo both get cold as well, but throw in the notoriously hazardous air quality, and I'm not liking the prospects of putting a park in this area of China. It's too bad the Chinese parks are not closer together, as they are along I-4 in Orlando, or at worst, a short car ride in Southern California. Hong Kong, Shanghai, and Beijing are not all that convenient for hitting the major parks on a single trip to China. At least with Tokyo and Osaka, you can somewhat easily do Disney and Universal. October 14, 2014 at 8:42 PM · I do know of one ip Universal has that will fit perfectly in there China theme park. Bruce Lee. Dragon: The Bruce Lee Story was made my Universal back in 1993 and they still own the official rights. How Universal Creative will make a ride/show is beyond me. I brought a Bruce Lee game for the iPad that had the Universal logo. What will be most interesting to see if this China theme park is the testing grounds Universal own ip's for there rides. For example the Bourne movies are still going and a ride or stunt show could possible, or a Fast and Furious coaster/dark ride, or how about Back to the Future 2.0. Hey, nobody thought King Kong could return and look was happen at Hollywood and rumor Orlando. But the kicker will be if we see new/reboot other ip's that could be copy for the America parks. Like the rumor Ghostbusters ride that was plan for Dubai, or Godzilla/Pacific Rim ride, Star Trek, James Bond, or get ready for this WB Loony Tunes/DC Comics land. Or a video game land, which Universal is making that World of Warcaft base on the MMO. Many of these have been rumor for Universal expansion for both Hollywood and Orlando, as well as, the fable 3rd theme park for Florida. I really doubt, Spider-Man ride is coming to China. Disney is making the Iron Man ride for Hong Kong, and yes Universal Japan as Spider-man. But the movie Marvel version is Disney key and I bet the Chinese guest will find Iron Man more recognizable then a bland Spider-Man comic book that Universal owns. Just food for thought there. All I say, this park could be the key for new rides and ip's for us here in America. Plus they have the dream every Disney fan wants. To stay inside or hair away to a theme park, and that China park has that plan very well. October 14, 2014 at 10:20 PM · I'm quite sure Universal will change their plans a bit over time- that almost always happens. I honest dislike the idea of having both Diagon Alley and Hogsmeade right next to each other, although they are both great in their own rights. The whole point of the Hogwarts Express in the films is to connect the two, which works perfectly in Florida because both Wizarding Worlds are in separate parks. How would the Hogwarts Express function with both Wizarding Worlds right next to each other in the same park? I know they certainly dislike the Simpsons in Japan, so that's why BTTF still remains in Japan. Sounds like they're still more welcome in China than Japan though. The blue building and the shops definitely looks more like Springfield than Sesame Street to me, but I could easily be wrong. The coaster behind the Wizarding Worlds definitely looks more like the Battlestar Galactica Coaster versus Dragon Challenge. If they already have Hippogriff and each WIzarding World has its own differences, it's probably Battlestar Galactica. Since its next to Transformers in Singapore, I bet the building behind that is Transformers. Not quite sure what to make of the building behind Hogwarts and Jurassic Park- maybe Animal Actors or one of the "unique rides" they're supposed to have? Maybe the building to the right of the entrance could be ET if we're lucky :) Though it could easily be a unique ride. Really not sure what the theme of the "Hulk" style ride will be though. It definitely won't be Hulk since Universal only has the rights to Marvel in Florida. October 15, 2014 at 5:27 AM · It will be a great adventure for whoever gets to work on these parks.........having done many parks overseas it has always been a learning experience that stays with you for the rest of your life. You not only get to build a park but you learn about the culture and food and if your lucky you make great friends for life.